I watched Giada make this on TV and thought it looked interesting and something I could make. With Google’s help, I figure that it translates to “Boiled Mix”. That doesn’t sound very appetizing. She serves it with a gorgonzola sauce and a spicy salsa verde. I like it with horseradish. 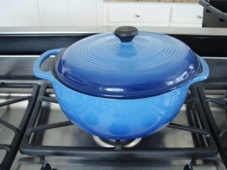 Heat a large braising pot over medium-high heat. Season the beef with salt and pepper. Sear the beef, browning it on both sides, about 5 minutes a side. 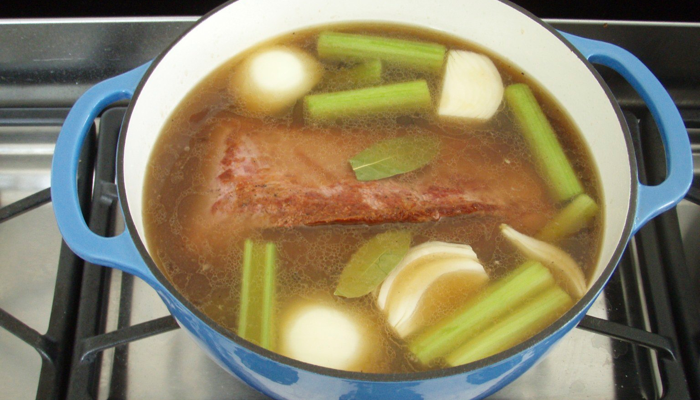 Carefully add the stock and enough water to just cover the meat. 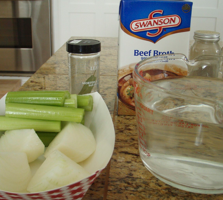 Add the onion, celery, and bay leaf. Bring the liquid to a boil. Lower the heat to a simmer, cover, and cook for 1 hour. Arrange the carrots and potatoes on a platter and cover with foil to keep warm. Continue cooking the stock uncovered over medium heat until reduced by half, about 20 minutes. Meanwhile, slice the meat against the grain, on an angle. Arrange the meat alongside the carrots and potatoes on the platter.